Fly Fishing Guide, a Federation of Fly Fishers Certified Casting Instructor and a member of the Federation of Fly Fishers Professional Guide Association. 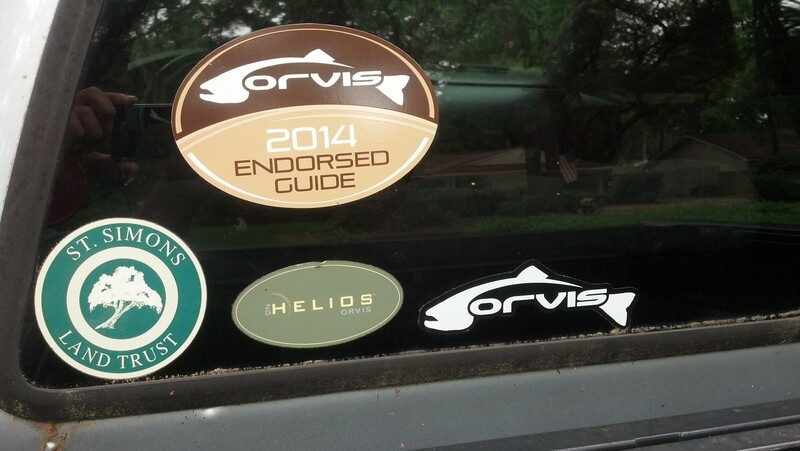 customer service and decades of fly fishing experience. November and December lived up to their reputation to have clear water and lots of fish. 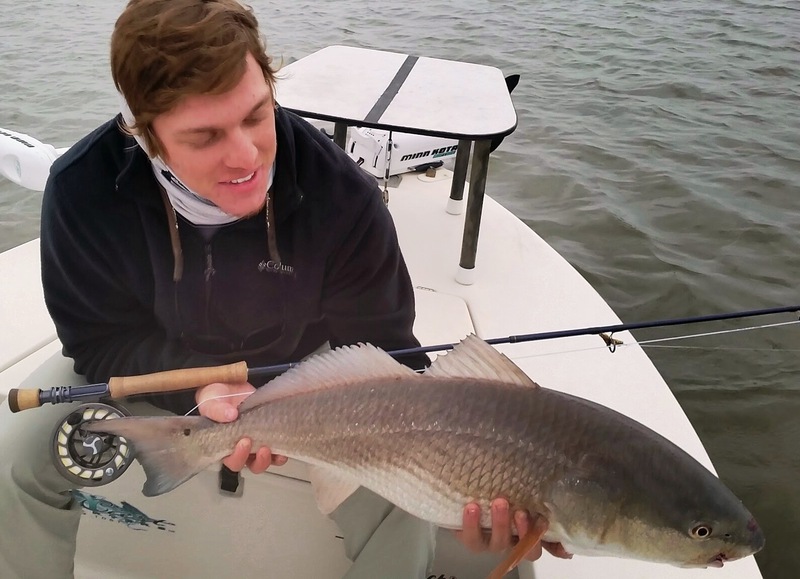 In November we saw hundreds of big red fish moving around some unpressured flats. Last week, we found some big trout, as you can see in Sallie's Big Trout. January, February and March promise to bring some of the best sight fishing of the year. The weather remains mild, and right now, in mid-December, the water temperature is in the mid to high 50's. This means the fish remain active and give a great fight. 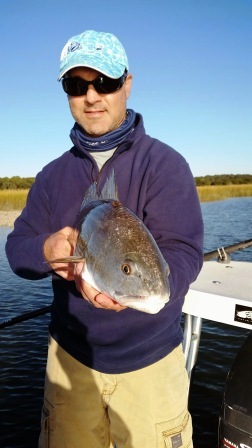 As long as we have clear skies and light winds, we should have some great days fly fishing red fish. Be sure to give me a call or email for information about some of the best days for fishing this winter. Are you still looking for the perfect gift for a fly fisher person? I make purchasing a gift certificate very easy. I can take a credit card number over the phone and email a personalized PDF gift certificate to you in less than a day. All you have to do is print it out and put it in an envelope. Give me a call if you are interested. Winter Time Red Fishing: Can You Be Flexible?? Winter can offer some of the best sight fishing of the year. The best fishing is weather dependent. Let me know if you can come on short notice. When I see a window of nice weather and good tides, I will send out a quick email or give you a call to let you know. I can normally be very flexible in the winter. If you can be too, send me an email and let me know. You could experience one of those epic sight fishing days of clear water, hungry fish and fast action. Please email or call me to let me know you can be available on short notice. I will put you on a first call list. I don't get a chance to go fishing very often, but when one of my daughters wants to go, I drop everything and off we go. Around mid December, I went with a friend who put me on a good trout bite in deep water around structure. When Sallie wanted to go, I knew exactly where. Sallie still hasn't mastered the fly rod, but she has mastered the spinning rod. She got lucky that day and landed one of the largest trout caught from my boat this year. Now, it is time for a fish fry. I take this time of year to thank everyone who has fished with me over the last twelve months. There have been so many memories you have made. 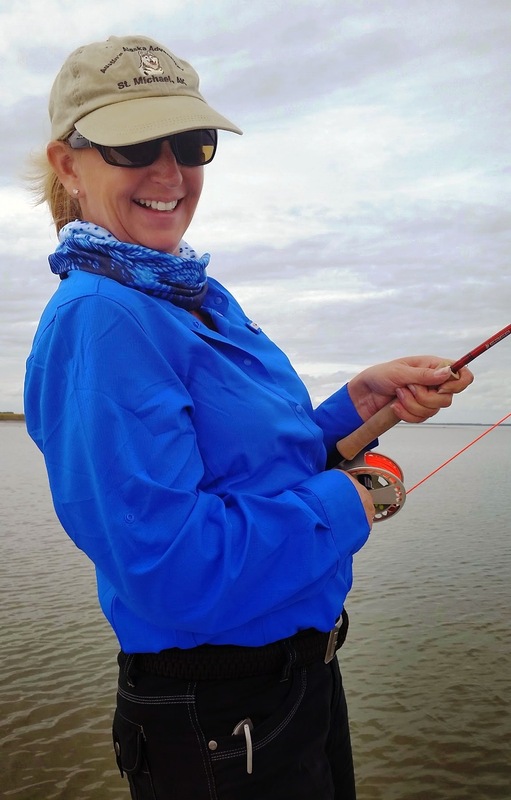 Julie laughing with delight as she fought her first red fish. Danny chasing one tail after another and finally connecting. Kenichi and how well he casts and how hard he worked to catch that first red fish. Clem and Susie coming down from Hilton Head and having Hawg Heaven pay off for them. Doug fishing with his sons. Jenny fishing with Graham and catching Slimey. Frayne catching a nice triple tail, and my falling overboard trying to net it. Charles calling from Africa to set up the trip. Chris and Megan, with her great smile, from Colorado. Michael fishing with his Dad Bob, who happens to be a neighbor. Jamey and his Dad Jim. Margot, a friend from 43 years ago, fishing with her husband Jim. Richard, Clay, Kent, Kevin, Amanda, Jim, Tim, Derek, Bill, Michael, Terry and George, Henry, Pistol totin' Brittney, Carter, My great friend and client Ed N, Michael and Kelly, Rich, Terry, Steve, Damian, Tripp, Chandler, Dean, Hank, Josh, Gary, Fred and Carolyn, Tom, Jeff, Jed, Staci, David, Judge Paul, Craig, Curt, Wayne, Tim. There are many more that I know I have left out. But to all of you, thank you for a great 2014. I hope your memories are as great as mine, and I hope to see you again in 2015. Tight lines, strip strike and practice the double haul. 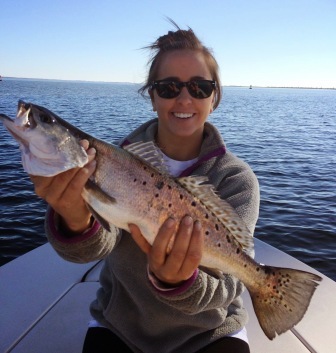 November brought some great fishing to the Golden Isles of Georgia. We had clear water, bright skies, mild weather and lots of big fish. While I am concerned about the total numbers of red fish in the Golden Isles, and flats that once contained hundreds of reds are now empty. I believe the combination of poor spawns several years in a row and increased pressure, particularly last winter, have severely impacted the number of fish. I can still find unmolested fish, but I find myself running farther and farther to find fish. Especially fish that haven't been pressured so much that the slightest noise in the boat doesn't send the fish fleeing. Fortunately, there are a few flats left that fish very well. These fish were caught on them. I met Julie at a First Coast Fly Fishers meeting earlier this summer. I knew when I met her she would be a great angler. You have to love a lady with a knife clipped to her pocket. She had been red fishing with a fly rod several times, with no luck. In early November, we ran to a flat I regularly fish in the winter. We had red fish pushing water all over. We had perfect conditions: clear skies, clear water and calm winds. We could see schools of 10-20 red fish pushing water and chasing small shrimp over 100 yards away. Birds were diving on the schools waiting to pick up the scraps. 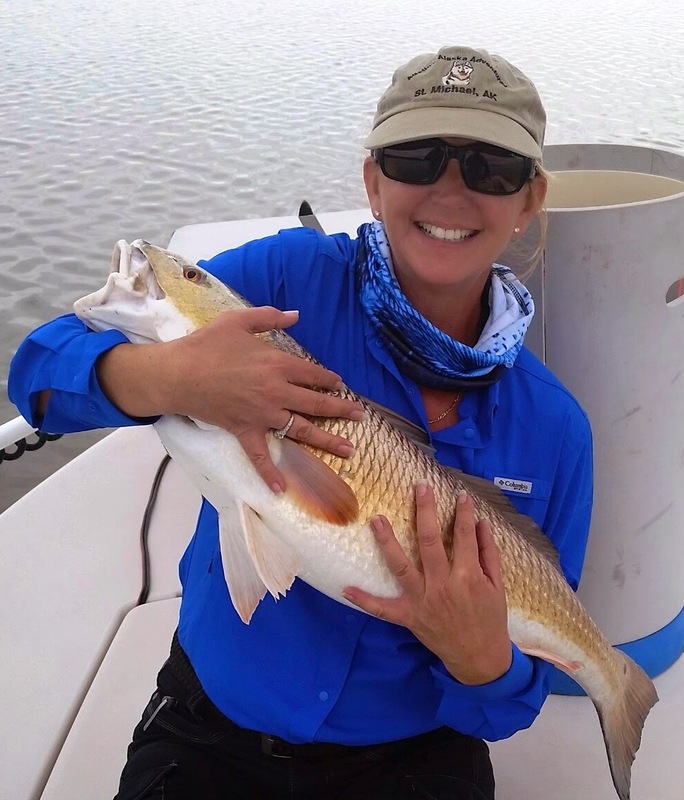 Julie has been working on her casting, and managed to land two 13 lb red fish. Her first reds on a fly. She came back later in December, and we faced much different conditions. We had fog, windy weather, dirty water and chilly conditions. We had a great time, but didn't get any fish in the boat. She will be back in January when we will chase these fish again. Michael is a college student in Macon. His Mom gave him a trip for his birthday. He is from Texas, and is a good fly angler. We had another of those magical days on the flats where the fish are pushing water, chasing bait and moving all around. When we are fishing, I never give up. After a few hours of casting to fish, and not getting any strikes and when it was almost time to leave, I looked down the flats and saw a nice school of red fish pushing toward us. All morning these fish had been pushing across the flat, then hugging the shore moving West. I set up the boat so Michael could send a long cast to the school before it got too close. He put the cast out and let the fly sink. As the school approached, he started feeding the fly to the fish. All of a sudden the line went tight to a 10+ lb red fish. after a few minutes, we landed the fish, tagged him for the DNR and performed CPR (Catch, Photograph, Release) on him. Tim from Tampa fishes with me several times each year. We normally fish the flood tides in late summer, but this year, he wasn't able to make it. In late November, we had super clear water, bright skies and light wind. As the tide went out, we noticed school after school of red fish working from the from shallow water to deeper water. One of the schools we saw was a school of Puppy Drum. Tim put the fly in front of one of the fish and landed one of the smallest reds my clients have ever caught on a fly---it was probably 12" long. Later in the day, as the water came in, we found some fish tailing on oyster banks. Tim cast to a fish I had seen and was rewarded with this nice slot red. He is planning on returning in January or February. 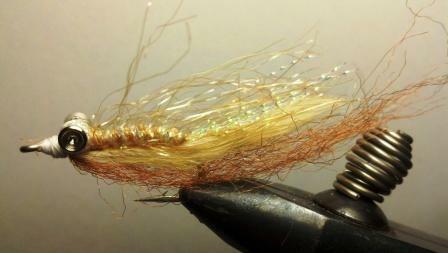 The fly that has been working so well for me on the flats so far this winter is the Prawn's Revenge. ​It isn't a new fly, and I have had this link several times in the newsletter. It is a great fly. Tie one, and see for yourself. Here is the link: Prawn's Revenge. I am playing with a variation of the SC favorite, the Red Fish Crack. I will fish my variation over the next few weeks. If it is a good as I think it will be, I will put the pattern up on the next newsletter. I will be spending some time in the shop when I am not on the water. If I am there, feel free to ask for some impromptu casting or fly tying instruction. I am always ready to teach and talk fly fishing. Not only are there up to date fishing reports, I am constantly adding new photos, information and videos. Fish the Golden Isles, and call me to enjoy, "Hunting Fish in the Marshes of Glynn".